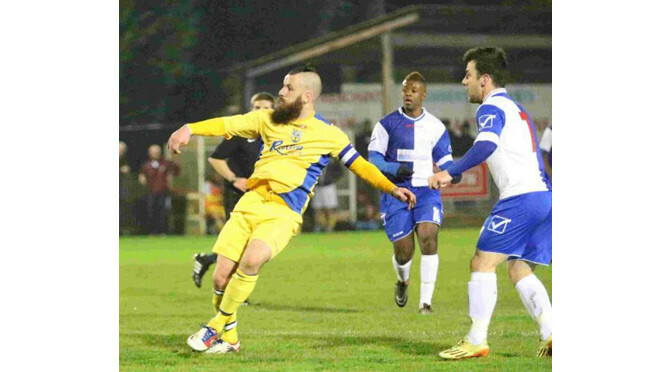 After Luke Burbidge was felled in the area by Jordan Copp, Steve Devlin – as he did at Tatnam in the teams’ previous league encounter – calmly slotted the ball past Weymouth boss Jason Matthews to draw first blood for the Dolphins. 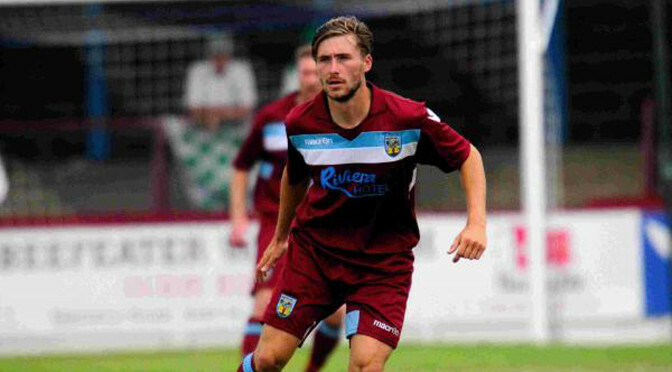 Goals from Chris McPhee and George Rigg gave Weymouth their first win in four league outings, in a closely-contested battle at the Bob Lucas Stadium. The duo both found the net inside the final 15 minutes as Jason Matthews’ side came alive late on to shake the Centurions. 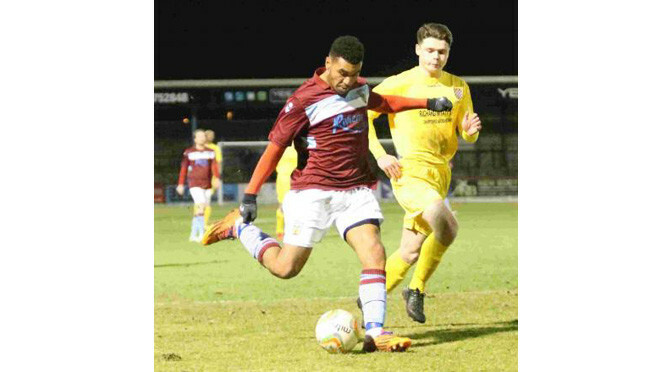 The Terras’ boss, who admitted the past week had been a test of his mental strength in the build-up, made two changes to his starting XI that was brushed aside at Corby on Wednesday night. Rigg and Jamie Laird were recalled to the line-up, with Ashley Wells and Steve Colwell both making way. In a cagey opening, the Centurions did have the ball in the net early as Matt Liddiard stroked home on the turn, but referee Iain Parsons had blown for a Weymouth free-kick long before he put the ball away. 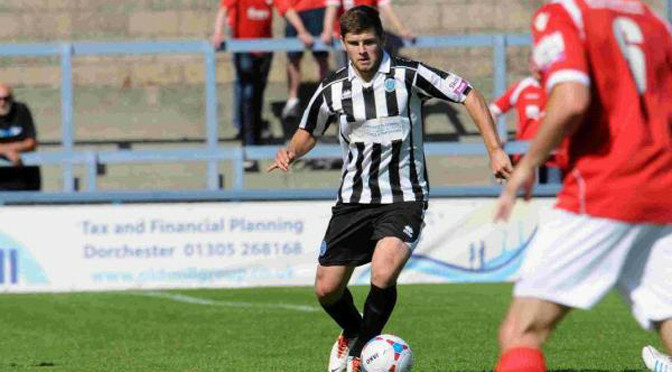 On his return to the side, it was Rigg who came close to making an impact for the hosts with their first opportunity. He gathered a loose ball and let fly from all of 25 yards to force a diving save from Cirencester gloveman Glyn Garner. At the other end, some panic in the Weymouth defence began to creep in. Operating at right-back, Calvin Brooks had drifted inside to deal with a ball forward and almost flicked his clearance into his own net. Weymouth then nervously dealt with a number of set-pieces from the Centurions. A low corner from Rigg was then drilled into the path of Yetton, who blazed over, and Brooks saw his ball across goal stabbed away after advancing into the Cirencester area. Brooks was then needed defensively and did well to keep up with the lively Jacob Davidge as the away side broke down the left. He forced a comfortable save from Weymouth player-manager Matthews, who got down well to his left to keep hold of the strike. The Centurions started the second half the brighter of the two teams and, after claims for a handball in the hosts’ box, midfielder James Mortimer-Jones rifled a fizzing attempt at goal, which clattered into the advertising boards. That came as part of a spell of dominance from visitors after the break and skipper Yetton retreated into the midfield to voice his frustration. Chris Shephard then showed great technique in what was a lively moment for Matthews’ men. He sweetly volleyed at goal and was denied by a superb reflex stop, and from the resulting corner, Yetton hit the ball marginally over. New signing Dean Evans was then handed his debut just past the hour mark, as McPhee was thrust into a more advanced role. Yetton must have then thought he had scored when his shot at the back-post from a looping cross was well saved by Garner, and McPhee and Adam Kelly saw their attempts on the follow up stabbed off the line. But as the Terras continued to probe, McPhee didn’t have to wait too much longer to break the deadlock. On 76 minutes, he brought down a long ball with a sublime touch, took the ball past the goalkeeper and tapped home into an empty net, much to the delight of the Terras’ faithful behind the goal. A long ball at the other end then caught the hosts napping, but Cirencester full-back Ellis Dunton failed to sort his feet out and scuffed wide in search of a leveller. Moments later, Dunton left a leg out inside the area and caught Shephard, who had cut inside on the right wing. Referee Parsons had no hesitation in pointing to the spot but up stepped McPhee to blaze the ball into the stand and squander a chance to put the game to bed. 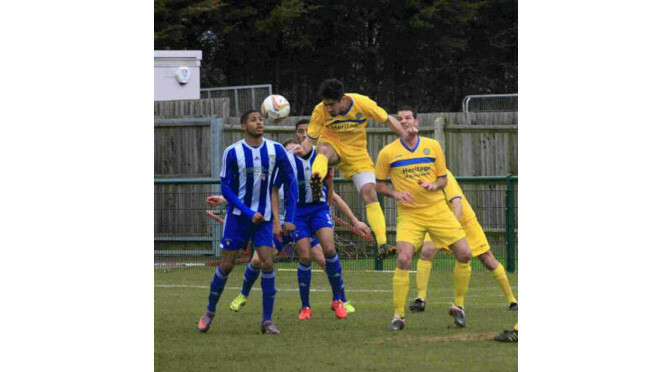 But as the Centurions pushed forward in search of a point, a slick breakway move wrapped the win up for Matthews’ men. Introduced in place of Yetton with five minutes to go, Alec Fiddes charged down the left on the counter and picked out Rigg, who finished clinically to seal the game in stoppage time. Weymouth claimed a share of the spoils with Redditch United having played the final 20 minutes with just 10 men at the Bob Lucas Stadium. A red card for Ashley Wells came in between Jamie Reid’s cool opener and a sublime strike from Reds’ full-back Calum Ferguson, which found the top corner on 75 minutes to give the visitors a point. Having added to his squad earlier in the day by confirming the loan signing of Robbie Matthews from Gosport Borough, Weymouth manager Jason Matthews placed his new recruit straight into the starting line up, as one of three changes from the side that lost at Poole Town a week previously. Alec Fiddes and Reid also returned to the side and Connor Riley-Lowe, Steve Colwell and Adam Kelly all dropped to the bench. And it was Exeter City loanee Reid, on what could be his final game for the club, who almost broke the deadlock after just three minutes on the counter attack. Following a corner for the visitors, he powered down the right to gather Chris Shephard’s precise through ball, and worked Reds’ stopper Sam Hornby with a stinging effort at his near post. The visitors then almost mirrored the Terras’ opening chance when Simeon Maye failed to gather on the break, and Weymouth captain Stewart Yetton swept the ball just wide of the far post after Reid and Shephard combined neatly once more. As the hosts continued to probe, Yetton, still sporting his protective headwear, jinked away from three men and fired into the stands. George Rigg then volleyed wide after Shephard had drawn Hornby out of position. 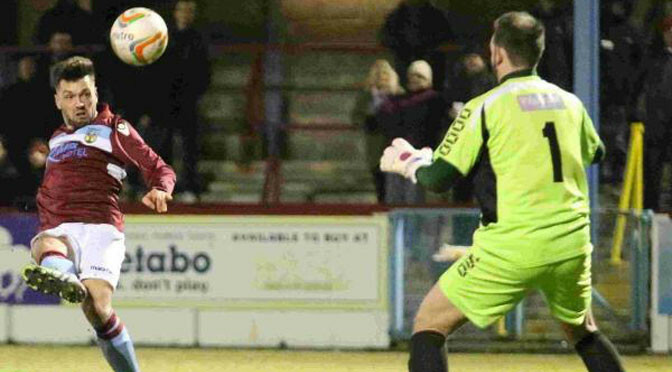 Chris McPhee’s diving header was then gathered from a well-delivered cross from Wells, and Terras’ boss Matthews found himself at full stretch to make his first save of the encounter. 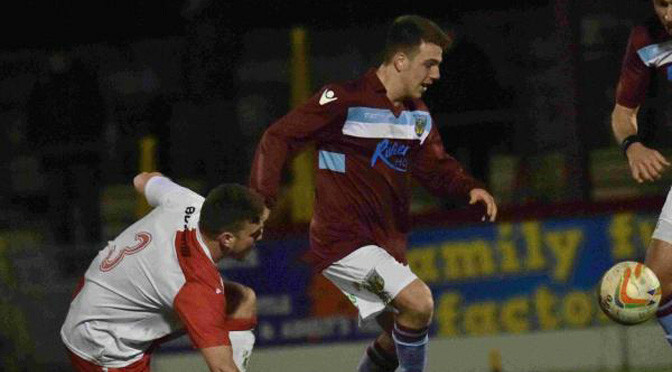 Having weathered Weymouth’s intent, Reds’ midfielder Leigh Phillips then steamed forward down the right. His rasping attempt across goal was palmed away by Weymouth keeper Matthews, who flew to his right to thwart the effort. James Mutton then headed over from the resulting corner. Yetton was then fouled which allowed Shephard to deliver a free-kick from deep, which just evaded Robbie Matthews at the back post in search of a goal on his debut. 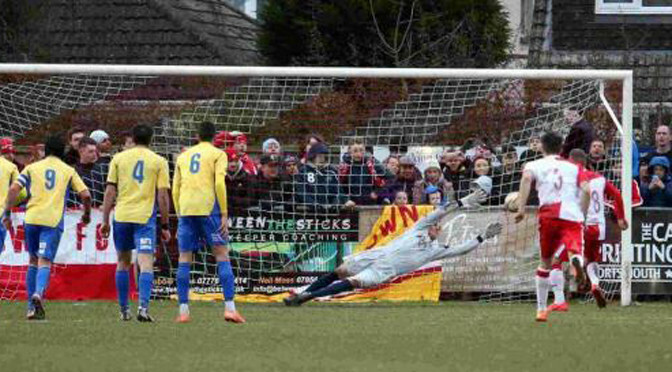 Following the break, Calvin Brooks must have thought he had put the Terras a goal up. He arrived at the back post to meet a devilish ball from Reid from the right flank, and saw his header kept out by Hornby, who stuck out a mitt at the last moment to pull off a sublime reaction save. A teasing cross from Redditch’s Phillips almost caught manager Matthews off guard as he scrambled to his back post with the sun in his eyes and saw the ball drift wide, with Reds’ frontman Courtney Baker-Richardson throwing himself into the Terras’ net in an attempt to put the ball home. The visitors started to look dangerous at this point and arguably should have drawn first blood through Calvin Dinsley. He failed to take his chance from the edge of the box after the away side dispossessed Shephard and beat the offside trap. But as Weymouth had started living dangerously, they showed their character, and took the lead on 67 minutes. Some slick work down the right hand side between Shephard and defender Wells opened up the visitors, and it was Reid who was on hand to put the ball home with a neat finish on the turn from close range. But, out of nowhere, Wells was given his marching orders three minutes later. He was adjudged by match official David Goard to have recklessly challenged George Carline, much to the disgust of the home fans. A man light, proceedings then got worse for the Terras, as Redditch notched a stunning equaliser. After Jason Matthews had punched a high ball into his area, there was nothing he could do as full-back Flanagan pulled the trigger and bent the ball into the top corner of the net to make it 1-1. With Weymouth rattled by the leveller, Dinsley tried his luck once again, and his dipping strike fell just over the top. But despite being a man down for the final exchanges, Weymouth held on to claim a share of the spoils, with Wells being awarded the sponsor’s man of the match accolade. Matt Liddiard’s first-half header dented Dorchester Town’s hopes of winning a third league game in succession at the Avenue. Weymouth’s title hopes were dealt a monumental blow as hosts Poole Town ran riot in the second half at Tatnam, to return to the league summit and leapfrog their Dorset rivals. 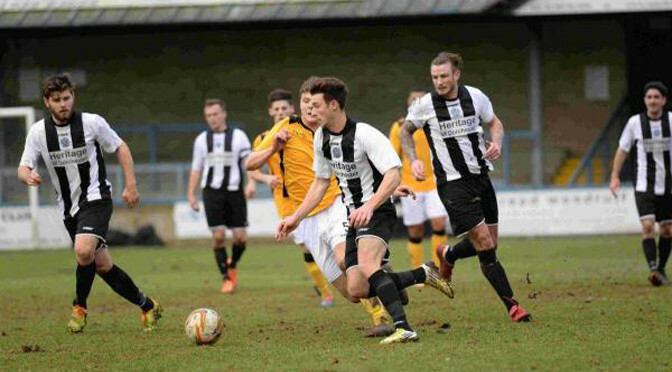 Dorchester Town side secured back-to-back wins for the first time under new boss Mark Jermyn, as a Nathan Walker brace helped see off Arlesey at the Avenue. Ben Watson also found the net for the Magpies in a match the hosts knew they could not afford to lose in their battle to stay in the Evo-Stik Southern Premier Division. Player-manager Jermyn kept faith with the side that started the win at Hungerford on the weekend, with the only change to the squad coming on the bench where Kieron Parrett replaced Oakley Hanger. The hosts began the game on the front foot and nearly went ahead four minutes in when Watson rounded Arlesey keeper Nick Thompson and struck a post from a very acute angle. Walker then glanced a header just wide from a long Chris Dillon throw, before Bradley Tar-buck went close with a left-foot drive. And, after Thompson got down low to deal with a Jake Smeeton free-kick, Dorchester’s bright start was rewarded on 13 minutes. Sam Lanahan slid a precise through ball into the path of Watson and the striker produced an assured finish to score past Thompson. The hosts were given a scare five minutes later when Hallelujah Basmel’s shot deflected off Walker and on to an up-right before being cleared. But it could well have been 2-0 to the county town side had Thompson not saved from Watson following a surge downfield by Portsmouth loanee Tarbuck, who was making his home debut for the Magpies. Other than Basmel hitting the woodwork and Martel Powell forcing a decent save from Alan Walker-Harris, the visitors had little to offer in the first half. Jermyn and his men would have probably felt hard done by if they had gone into the interval only one goal to the good – but that wasn’t what happened. A Tarbuck cut back found Walker in space inside the Arlesey box, and after his first attempt was blocked, the defender-turned-forward buried the rebound. The only negative to come out of the first period for the hosts was Lewis Morgan’s booking following a rash challenge on Powell. Like the first half, the Magpies started the second 45 minutes by hitting the woodwork. This time it was Tarbuck who shrugged off his marker and whipped in a shot that caught the far post. Dan Smith’s presence on the right wing became more noticeable as the game went on and his cross over the onrushing Thompson was almost turned into his own net by Warren Plowright. A third goal would have really made the game safe for the home side and it duly arrived on the hour, Walker climbing highest to nod in Smith’s corner. There was very little to get excited about during the next 20 minutes, then Arlesey were given a lifeline with seven minutes left. George Ironton scored from the spot after substitute Leon Lobjoit had been brought down in the Magpies’ box. A few nervy moments for the home side followed but there was to be no dramatic comeback by the visitors.